Audient ASP800 8 Channel Mic Preamp and Converter (NEW). The Audient ASP800 is an audio powerhouse designed to transform your sessions into world class recordings, making it the perfect addition to your audio interface. 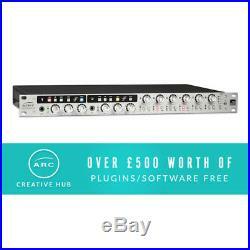 Audient ASP800 8 Channel Mic Preamp and ConverterMain Features. 8 x World Class Audient Console Mic Pres. 2 x Retro Channels with Dual Stage COLOUR Saturation Controls - HMX & IRON. 2 x Discrete JFET Instrument Inputs. Pristine 118-dB Burr-Brown A-D Converters. I's and two Retro channels with revolutionary tone control. Just plug in your mics, guitars, keyboards and drum machines and you're ready to go, so get creative and start thinking big! Upgrade Your Sound Whether you're recording drums or simply need more channels, ASP800 is the perfect tool for expanding your existing interface via ADAT. Its flexible and intuitive feature set will transform your current setup into the complete recording rig, perfectly at home recording both acoustic and electronic instruments. World Class Mic Pres Audient are the only company that use the same Class-A mic pre design throughout their entire product range, whether you're in the studio with an Audient ASP8024 console or on the road with ASP800, you're always guaranteed the same world class Audient sound. Developed by design legend David Dearden and optimised over 18 years, this mic pre is used by thousands of professional studios around the world. With its versatile nature and smooth tone, the ASP800 will quickly become your'go to' mic pre. The Retro Channels Audient are known for their super clean mic pres but that doesn't mean they don't understand the importance of adding colour. Whether you need to add growl to a bass guitar or make those vocals sparkle, ASP800's revolutionary harmonic generation circuitry has got you covered. Retro Channels 1 & 2 feature two unique variable harmonic COLOUR controls per channel - HMX & IRON. Designed to emulate tones often associated with 1960's tube designs and the coveted transformer zing of British audio in the 1970's, HMX & Iron will add new dimension to your audio by providing warm, sparkly tones. Better still, you can combine them to get anywhere in between! HMX - MOSFET Drive We know that plenty of engineers love the sound of tubes/valves and if you're one of them, then you're going to love HMX. Travel back in time with ASP800's very own custom harmonic distortion control. Similar to vintage valve preamplifier designs of the 1960s, HMX provides a sweet, thick tone that will sound incredible on anything from drums to electric guitars. Try it on bass synth, or 808 too! By using discrete MOSFET technology, HMX produces asymmetrical harmonic distortion giving you the option to add richness and body to the pristine tone of the Audient mic preamp, D.
Take control of your sound and bring your audio to life, 1960's style. IRON - Magnetic Transformer Drive Say hello to Audient's BRAND NEW British transformer saturator - IRON. A testament to innovation, IRON uses a custom British transformer with a high voltage MOSFET drive network designed to recreate that sparkly,'sounds like a record' signature of 1970's recording. With one control that simultaneously alters drive impedance, bass response, high frequency damping, phase shift, magnetic saturation and transient shaping - IRON can instantly add sparkle, growl and so much more with one twist of a knob! It sounds killer on snare, bass, acoustic guitar and anything that needs some extra bite. Pristine Converter Technology ASP800 provides you with high performance 118-dB AD converters from Burr Brown, the leaders in converter technology. Quality in the analogue stages of their design comes from years of experience as analogue console designers, and when coupled with outstanding converter technology it enables you to hear audio as it's supposed to sound. The importance of converters should never be underestimated. Plug and Play As well as offering you 8 channels of mic pre, ASP800 has two harmonically rich JFET D. Designed to replicate the input stage of a classic valve amplifier, you can plug your guitar, bass, keyboard or drum machine and start recording instantly. Built to Last The result of years of experience in analogue design combined with a focus on precision and detail, ASP800 packs a powerful feature set in a ergonomic 1RU rack mount. From it's beautifully crafted hand milled aluminium knobs to its all-metal construction, ASP800 will stand up to countless late nights in the studio and days on the road. Listing correct at time of upload errors and omissions excepted. Absolutemusic was set up over ten years ago by a group of passionate audio professionals who wanted to deliver better service and greater savings on music gear than could be found anywhere else. We've since grown into one of the UK's leading music retailers and we've recently moved into a huge new two-storey superstore boasting three massive guitar display walls and dedicated departments for drums, guitars, DJ, live sound, synths & keyboards, hi-tech and accessories. We also have four guitar booths, two soundproofed drum booths, an in-house Guitar Workshop and a unique monitor-auditioning studio designed by acoustician Andy Munro. Next door is our café and complex of rehearsal and tuition studios available for hire seven days a week, where we also run regular workshops, instrumental lessons, demo events and recording sessions. Soon to be added is a professional recording studio and control room. Every member of our 50-strong absolutemusic team is an experienced musician or engineer who can offer you accurate , expert advice on anything from vintage guitars to the latest software. Join us here soon to see our amazing 14,000-square-foot showroom and 10,000-square-foot studio complex, and to enjoy our regular in-store events. (absolutemusic, Knighton Heath Estate, 855 Ringwood Road, Bournemouth, BH11 8NE). Exceptions may apply to non-mainland destinations, the very north of Scotland and non-UK destinations. Most items are delivered on an overnight service (2-3 days for non-mainland UK and 3-5 days for mainland Europe). Our store opening hours are. Monday - Saturday: 10.00am - 6.00pm. Please note, our Web team are only in Monday to Friday. The item "Audient ASP800 8 Channel Mic Preamp and Converter (NEW)" is in sale since Wednesday, March 21, 2018. This item is in the category "Musical Instruments\Pro Audio Equipment\Preamps". The seller is "absolutemusicsolutions" and is located in Bournemouth. This item can be shipped to United States, European Union member countries, Canada, Norway, Mexico, Switzerland.